NOTE* Hardin or Harden? The spelling in his will is Hardin and he signed it Hardin (I am aware the will on file in Lowndes County is a hand written copy). The spelling on his cemetery marker is Harden. Since I do not know who ordered the marker I have decided to use his signature as the correct spelling. In the 1885 Historical Sketch of the Bethel Church they spelled his name as Hardin. Census 1830* He appeared on the census of 1830 in Patrick County, Virginia, Males <5 2, 5-9 2, 15-19 1, 40-49 1, Females 10-14 1, 30-39 1, Slaves 80. 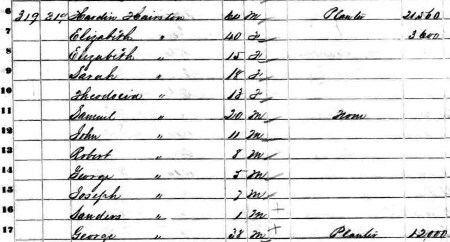 Hardin is also listed in Henry County, Virginia as a Non-Resident with 7 slaves.